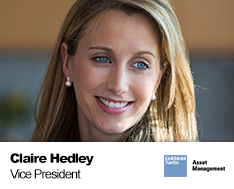 Claire Hedley is a vice president in the Alternative Investments & Manager Selection (AIMS) Group, based in London, where she is focused on Environmental, Social and Governance (ESG) and Impact Investing initiatives with clients in Europe, Middle East and Africa (EMEA). Previously, she focused on AIMS risk management and analytics for hedge fund strategies. She received a BA in English Literature and Language (Euro), with honors, from the University of Leeds, England.